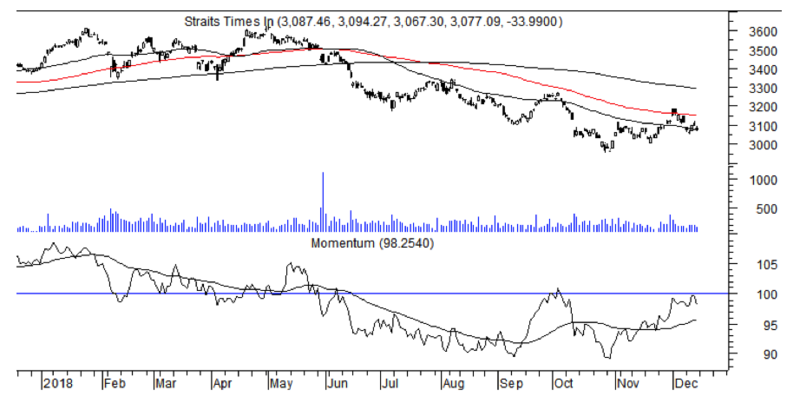 SINGAPORE (Dec 14): The Straits Times Index has been unable to gain strength as short term stochastics turned down, and quarterly momentum encountered resistance. The index eased and is now testing its declining 50-day moving average at 3,077. Directional movement indicators are neutral. ADX is falling, and DIs are positively placed. The STI had moved above both its 50- and 100-day moving average temporarily during late November. Annual momentum continues to decline and this is likely to restrain rebounds and keep the index below its 200-day moving average. Support appears at at 3,058 initially and at 3.007 subsequently. Venture Corp made a new one-year low of $14.48 on Dec 14. Despite this, prices are still hanging on to the four-times tested support at the $14.50 area. Quarterly momentum is flat. However, short term stochastics and 21-day RSI are falling, as is annual momentum. These indicators are exerting downwards pressure. A break below $14.50 indicates a target of $11.50. A move above $15.40 invalidates the downside.